Posted in Misc and tagged Eighth Amendment, Referendum at 5:19 pm on September 26, 2017 by Broadsheet. Vote no on everything, just in case. What about a maybe box to tick when you don’t know, can’t make up your mind or couldn’t care less. Do you want women to die needlessly as a result of treatable complications arising from pregnancy? “No” would be the correct vote based on that question. Toe up tells an outrageous lie and the comment goes unmolested by moderators. Yet anybody using ordinary everyday language to describe the truth inherent in the act of abortion will have their comment immediately rendered into gobbledygook. The Broadsheet propaganda bias rolls on. Vote no and there will still be over 3000 Irish abortions a year. Vote yes (on abortion) and there will be far more. By the way, anyone interested in seeing the “slippery slope” in action should observe how the requirements for a divorce are being proposed for reduction (5 years to 2). Not a life or death change, but the same will be done for abortion – as is currently being lobbied for in the UK (1 doctor instead of 2, etc). You’re absolutely right. It’s almost as if…I don’t know…society is … in some ways … progressing? It is a brutal reality, and ideally it would never be necessary, but some times it is. Abortion happens. If that makes you uncomfortable, well don’t have one. But we can’t continue to limit access. Abortion is illegal only for poorer women in Ireland. A time limit on divorce should *never* have been in the constitution – in my opinion. Similarly,the Abortion referendum should either be to repeal the 8th, or replaced with a vague “legislation regarding the availability of abortion must be passed by the Dail”. They should not try to add specific reasons for abortion into the constitution. Gov will dissolve itself just before the final signature gets blotted down to finally set a date.. just as they planned. Fudged. The blasphemy one will be gas stuff altogether. Methinks the noodly FSM will be busy. Quite right you are Bisted. How remiss of me. Praise be to his noodly appendages…. blasphemy corrected. So… is THIS good news lads? Of course Leo is still the devil incarnate. They can stick their “indicative schedule” up their collective botty. 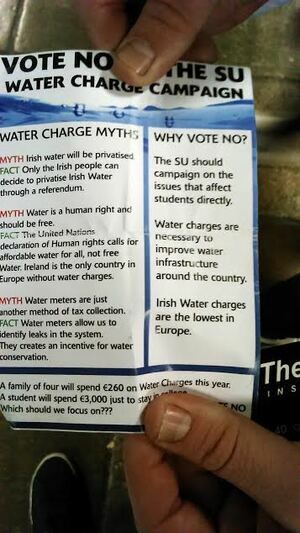 No sign of referendum on water. 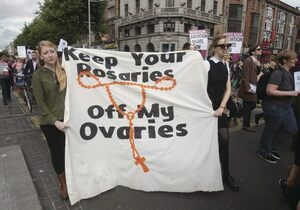 BTW, I’m pro choice, but the ‘rosaries/ovaries’ line is so clumsy and clunky – just crap. To be fair, I was admiring the creativity (sorry!) of the slogan. Also, does anyone know what’s the story at Waterford Whispers News – is it end of days? Their site appears to be down. They’re still celebrating the Dublin win, Shayna. Should be back late October. The slogan is not designed to change minds, its just a gleeful opportunity to have a go at those who are religious. Lets see how that works in the campaign. Nice and divisive already. The religious only account for a few thousand these days. Most “catholics” go twice a year, or a few more when the little one is making communion and there’s a bouncy castle to be hired. And more than 1.5 million at mass each week. Or just a few thousand, whatever. Nice casual bigotry there Daisy. How do you parse that with the gigantic vote against hierarchy and doctrine for marriage equality, NJ? Or the use of contraceptives and cohabitation for that matter? Is mass attendance an indication of anything other than a social / community thing in small communities? Attendance is barely in the double figures in Dublin like. Where’s the bigotry in pointing out that Bouncy Castle Catholics aren’t really catholic by the standard imposed? Most people do the communion day for the party, not for the haunted bread bit. If the church still had any sort of influence we wouldn’t be having half these referenda. Your language is totally bigoted and intentionally so which makes it crueller. The hypocrisy stinks as well as you will be one of the first on here spouting about equality and inclusion. You obviously dislike and dismiss catholics based on their religion, you question their authenticity, you bundle them together and your denigrate their intentions. Thats bigotry. Mocking the communion is just another nasty dig that displays your need to hurt. 78% of people identified as RC in the 2016 Census. The weekly mass attendance figures seems to hover around the 35% [of Catholics] mark – which would be 1.3 million (again, based on 2016 census). Why are you worshipping a murderer? Daisy, you words make you a bigot and a hypocrite. You hate people because of their religion.The pathetic/jokey reasons you give just display ignorance as well as a glee in others pain. Maybe youre doing it out of revenge, maybe out of just old fashioned hate. But catholics seem to get the same treatment on BS as Palestinians do in Israel. They are fair game for any humiliation, insult or blatant lies. (By the way, the Bible is just a book. People believe it- its not “written evidence”.) Shh. You’re equating the the situation of Catholics in Ireland with that of Palestinians? On BS. Read my comment. Sorry no outrage there for you to grasp to. Happy to be corrected on that Cian. I think your calcs look right. As you know – hard to get reliable mass attendance stats (I’m not sure they’re needed for anything to be fair). They seem to think anybody with an opinion that differs to them are religious, bigots, alt-rights etc.. but in reality its just someone who has a different opinion to life than they do. I don’t see where they say that, Bill. There are lots of reasons why some people are anti-choice. Religious conviction is one – but it’s probably the most objectionable. Being pro life is Humanism 101. No need for religion to see the value in not aborting human foetuses. You clearly need to look at Humanism again. The key message (if there can be said to be one, given its openness to plurality) is that we as human beings may only find peace and happiness here on earth and in/with/through/because of other human beings and through our existence as living, temporary beings in this form. This suggests that, as medicine and science have developed, we as humans can understand our bodies better and are capable of intervening before things go wrong – so we can perform abortions when the woman’s life is endangered but before she dies. – Humanism 101. Or, to put it in non-Humanist terms, God is wonderful, it has given us such great wisdom and the ability to learn and grow as a species (because we are the chosen ones, not the ducks, or gerbils, or the delicious, delicious chickens of course)…etc. This includes reality television, iPhones, guns, chemotherapy, and abortions. We must use everything it has given us in the best way we think possible. There is a justification for the use of all of these things at some point (I find it particularly difficult to admit to the use of guns, but I will not close my mind off to the possibility that someone else may be able to justify a time to use such an object in a positive fashion). Which is to say, abortion is one of God’s many gifts to humanity (if you are so inclined), and who are you to presume to understand God’s infinite wisdom so that you can comfortably dismiss one of the gifts bestowed upon our petty, mortal souls? Whichever way you spin it, the ultimate conclusion is that there exists and ethical framework for abortion (either within Humanism or any religion). But don’t worry, if that makes you uncomfortable we also have personal freedom and choice, so, how about you don’t have an abortion? And this isn’t even to touch on the ‘value’ of procreating and it’s ethical implications which you appear to take for granted (although I’m open for correction, of course). They’re not floating in a tank. No need for basic human decency to see the value in not treating a grown woman as a growbag. I’m pro life and I loathe religion. Interesting to see how Sinn Shapeshifter Fein handle it. It’s funny how everyone thinks referendums are great in Ireland but an absolute disaster when the British people have one and vote for Brexit making them all racist,xenophobic Little Englanders. Could I just add, referenda are a slight on how we vote. A political topic of the day is used to sway one’s vote. I do vote, always used my voting right., it may appear pointless, recently in The North, it’s kinda pointless. I’ve never been a fan of the term “Nordie”.. – as an aside. Referendums, please. It’s a gerund and so has no plural. Note quite, DavidT. It’s a Latin word. And because Latin doesn’t allow for plural gerund, trying to make a plural by adding ‘s’ introduces a different meaning. Adding an ‘s’ pluralises the act of voting, not the actual ballot. So ‘referendums’ would mean more than one ballot on the same issue, which isn’t the meaning we intend (unless you’re referring to a previous abortion referendum, then yes). The alternative – referenda – means a single vote for more than one different issue. So the referendum on the Seanad abolition and establishment of Court of Appeal was actually a referenda. So both are equally wrong (or equally wrong if we decide ‘referendum’ is now an English word and we can pluralise it either way). Or we could use ‘plebiscites’. Nothing to do with the vote, Charger. It was the result and the reasoning applied, which did show up the majority of Brits as being parochial and ignorant, and generally lacking the intellectual nous to properly understand the issue before them and the repercussions of their decision. Like a bunch of toddlers voting for more lemonade. All the 52% were thick and only the 48% really had a clue what Brexit was all about. Did you ever stop condescending to wonder how many of those ” parochial and ignorant ” Brits were actually Irish leavers entitled to vote in the Referendum ? You know,the tens of thousands forced to leave Ireland because their own politicians failed them – the same politicians now railing against the country that once again mopped up their mistakes? But don’t worry – the French and Germans will look after Ireland. Unified corporate tax rate and EU Army anyone ? “Did you ever stop condescending?” God, the irony. Seeing as 18% of the UK’s electorate are either Irish or claim Irish ethnicity (however tenuous), it’s a stretch to blame us for your stupidity on this front. And almost three-quarters of them live in London the home counties, so, if anything, contributed to the remain vote. But you don’t know which way they voted. You’re just presuming they all voted Remain when they might just have voted Leave. The Irish figure prominently in working class areas which on the whole voted to Leave. Not according to the last census, charger. You don’t really know what you’re talking about, do you? All bluster and ignorance. You’re essentially a Little England stereotype. It’s unfortunate and unpalatable. If you think *that’s* funny, you should try the big bang theory. Pure gas! From a pro life point of view, the more extreme the proposed changes, the better. As it’ll be rejected. But I suspect the government will craft something a bit milder so it has some shot at passing. If it is rejected, what do antichoice hypocrites like yourself plan to do about the 3000 Irish abortions a year? Will you move on to getting the 13th repealed so women will have to prove prepregnancy before being given permission to leave the country? I thought we agreed that we’d both look at this campaign after the thread to the 8th Amendment had passed? the govt put much store on the recommendations of the constitutional assembly at the time. they will have no choice but to implement those recommendations in full, despite what their own back-benchers think. the government also have a handy scapegoat in the CA in that the recommendations are not of their conception but in the interests of democracy they will implement them, yada yada. Do pro choice people really think the voters will pass what the CA suggested? That those proposals would survive a referendum battle? Fair enough if people think they will. I honestly can’t see it. Who knows? Not everyone thinks that women should be tortured for the worship of an imaginary old man in the sky who hates abortion but refuses to do anything about it, despite being omnipotent. Ah, if it were only that simple. I think you are confusing your hatred of Catholics with the desire for bodily autonomy for women. Or maybe in your mind they are the same thing? Is the CA a typical cross-section? It’s supposed to be. Could you see anti-abortion people recusing themselves from the assembly? What’s peoples’ thoughts on the make-up of the CA? Yeah but you *insisted* that someone actually use the word ‘destroy’ so you could get one over on a pro choicer. You’re *heavily* emotionally invested in this. I don’t think anyone needs to pay heed to your opinion on what the Irish electorate thinks about abortion. You’re a *teency* bit biased. The CA was a cross section of Irish society. If the CA recommended that, there’s a very good chance the Irish people will vote for it. You’re in a minority, Justin. Ireland is slowly freeing itself of the evil inflicted on us by that church. It is that simple though. If you think that women are competent to decide whether to carry a pregnancy in their own body to term, than the answer is clear. If you think women are not competent to make this decision, you can’t also argue that it comes from a position of respect for women. And yes, I think the weight of history is behind me when I state that the Catholic Church sees women as a mildly imbecilic means to an end rather than an end in themselves. It will be a shame if people allow their hate of the church define how they campaign. Many catholics will vote for repeal on compassionate grounds, that happened in the gay marriage referendum. They are not all the monsters that they are painted to be on here. But if you’re still stuck in a battle against the church instead of for bodily autonomy, then you will do more damage than good and cause more division than needed. Abortion, divorce and blasphemy? I’d say Quinner is cancelling all appointments for the next 12 months. (Repeal)- Hey jesus freaks!… STOP trying to control the minds of people by manipulating society and families through the matriarch and how they choose to use their sexual reproductive organs…. (Jesus Freaks)- Boooooo!!!! Down with this sort of thing!. Our god says save the 8th! .. Remember Jesus?.. He saves too!….Eamon..
Well, I tried to save the 8th last night…. but I was watching the late great Christopher Hitchens riff on about a cult of suffering run by some lunatic nun… I just couldnt stop laughing…. .. after about five minutes in, basically I had nothing left. I’ll vote yes to repeal. The citizens’ assembly decision reflects, in the main, the opinion of people I know. Funny, that. 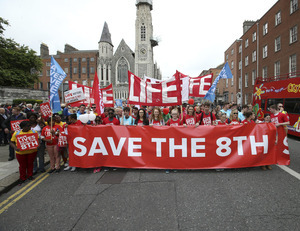 You know what would reduce the incidence of abortions in Ireland? If the Catholic Church stopped advocating the pull-out method as a form of contraception. Where do they advocate that? And what evidence do you have that it would work? Or is it just another gratuitous go at catholics? How often do you attend mass, Milo? Not very often. Anyway, do you want to answer the questions or are you just here to have a go at catholics? Theres a few bigots on here so youre in good company.